I can’t seem to lower myself into the dark depths of the ‘basic internet’ with its Snapchat deer faces and stories that are automatically deleted shortly after they’ve been published. But it's essential for your university ot have a presence on these platforms. In 2016 alone, Snapchat and Instagram alone had 250 million active daily users. As an example, you could post a series of photos or videos portraying what a typical day in the life of a first-year student would look like. Or you could dedicate posts to different courses, focusing on a particular detail of what makes that course interesting to study. Additionally, Facebook has ripped Instagram Stories; just months after the Facebook-owned photo-sharing site copied the feature from Snapchat. This feature will be increasingly developed and foregrounded in the coming months. Augmented reality wasn’t just a Pokémon Go! fad. Yes, every episode of Black Mirror is coming true. Instead of hiding under the bed and pretending that technology is not taking over the world, higher ed marketers must embrace AR. As an example, you could create your own image filters consistent with your branding. See below an example from Loughborough University. Since AR is a growing trend, it’s vital for marketing and recruitment professionals to think outside the box and watch it closely. User’s preoccupation with FOMO has resulted in Facebook’s new live video feature. Universities are using Facebook Live to beam footage of sporting events, campus tours and other activities related to student life. 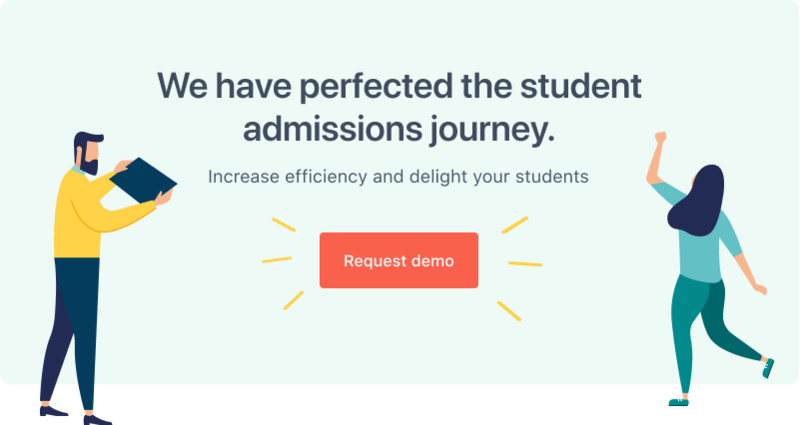 This feature allows universities to connect with prospective applicants in real-time. Viewers can respond with comments and emojis, and you can answer questions and respond to comments as they’re posted. Using bots to communicate with prospects is something student recruiters should approach with caution. It’s difficult to tell how a specific target audience will respond to this type of communication. A bot that delivers a poor, impersonal user experience could discourage potential applicants. That being said, the option to chat to a live admissions professional or leave an offline message is gaining popularity within higher education. Many universities have also started using WhatsApp, text messages and these Chinese social media platforms to great effect. As much as the Sarah McLaughlin BCSPCA animal cruelty commercials pull on my heartstrings, prospective applicants do most of their research while they are on the go. HE marketers should note that today’s consumers, especially young consumers, are increasingly wary of branded content. student life and can lend an authentic voice to your brand. To learn more about how technology can transform your marketing and recruitment processes, contact us for a free consultation.